Quote; "The Mull of Kintyre Chinook helicopter crash (on 2nd June 1994) has all the hallmarks of a state-sponsored HIT that has just been buried too (with all the 29 victims interned with undeclared bullet holes/gunshot wounds in their innocent heads/bodies) with no recourse to justice (for victims, families, political figureheads or bemused and fearful intelligence agents, coroners and their families or courageous whistleblowers in these sectors). Logic or motive in such state sponsored crimes frequently cannot be applied or explained but funding for the Irish problem was a transatlantic political hot potato for 2-3 decades (and the Mull of Kintyre Chinnook was full of highly qualified experts who were expected to quickly deliver results for the politicians on long term sectarian fueds and the policing/arming of these factions by superpowers both sides of the Atlantic). Ireland has been torn apart and persecuted endlessly by its expansionist & greedy neighbours for over 500 years but funding is probably more important than political, sectarian or Imperialist ambition. Because of constitutional confounds and the need to maintain National security (and bury the facts until victims and perpetrators are long dead)....justice cannot be delivered and truth must be avoided at all costs. The trials and inquests cannot produce a definitive outcome because of those ancient legal oaths at the temple bar (that pledges loyalty to the Crown Templar....the richest institution in the world which used to have an Empire upon which the sun would never set). In the Mull of Kintyre "crash" , the lack of evidence from the coroner, and the STRICT SECRECY that the sensitive "intelligence-related" massacre has always relied on makes the whole affair a shameful incident in British-American history. So Scotland was picked for its naivety and the grieving relatives were just paid (like the judiciary) to conduct secret affairs of state in fear of their lives too!"..and.. I myself, having spent most of my life in military and civil aviation (especially in helicopter operations) find it totally unacceptable that the original board of inquiry and this second inquiry did not even attempt to look at possible sabotage or some top level “Black Ops – Covert Operation” as being the possible cause of this terrible crash. It goes without saying that once again I have to give my account of events that day in the hope that you the public can see through this quagmire of deceit that has once again been played out by our government. Having been involved in helicopter operations and observing some very grey areas in the initial inquiry I embarked on my own investigation, compared the facts and statements made and then purely by accident received whistleblowers information that clearly told me that the Government, MoD and the RAF lied to us all!!" Go to: https://sites.google.com/site/profgeorgeleesrevelations/justice-the-horrible-truth/mull-of-kintyre-assassination For full article. 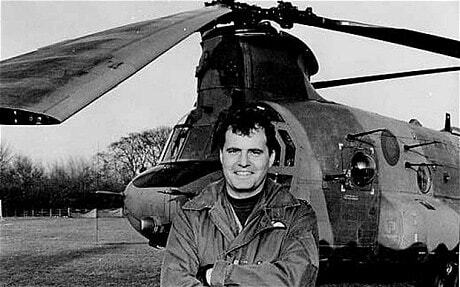 Quote; "For 17 years the British authorities have lied about the fatal RAF helicopter crash on the Mull of Kintyre in which 25 senior counterinsurgency personnel were killed. Now Global Research reveals new evidence showing that the loss of life was an intentional act of sabotage. It was the worst single loss of life by Britain’s Royal Air Force since the Second World War. 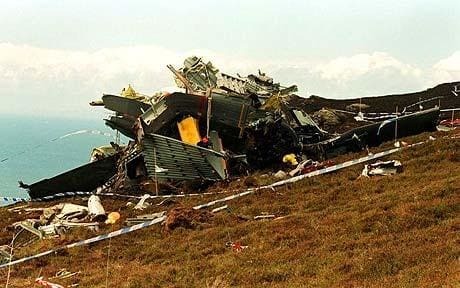 On the evening of 2 June 1994, an RAF Chinook military helicopter slammed into a mountainside on the Mull of Kintyre in thick fog, killing all 29 onboard. Among the dead were four RAF crew and 25 of Britain’s senior counterinsurgency personnel. The latter – including British Army officers and mainly members of the Royal Ulster Constabulary – had overseen Britain’s “dirty war” operations against Irish republican militants during 25 years of conflict in Northern Ireland. The RAF Chinook – ZD576 – was taking the team of counterinsurgency experts to a high-level security conference at Fort George in Inverness (at the eastern end of the Great Glen). The helicopter took off from Aldergrove in Co Antrim, Northern Ireland, crossed the Antrim hills and the narrow Irish Sea to the Mull of Kintyre, and was to have headed along the Scottish coast to the western end of the Great Glen, thence along it to Inverness. But the ill-fated Chinook never made it to Fort George. About an hour into the journey, at around 6pm, the transport helicopter crashed into a hillside 800 feet above sea level on the Mull of Kintyre. Initial suspicions of a Provisional IRA spectacular against the British enemy never gained traction. The crash was quickly understood to have been a tragic accident caused by poor visibility in bad fog – weather conditions that are a routine hazard in that part of the British Isles even in summertime." Go to: http://www.globalresearch.ca/britain-s-cover-up-of-inside-job-in-fatal-raf-chinook-crash/27828 For full article. "McGartland, and he was on the ground at the Mull of Kintyre to be picked up so that he could be taken to the conference. He would tell it that the Provos were on the ropes, thanks to what he and Phoenix’s people had done – what would be a great embarrassment and set-back to the BOX. The person they planned to pick up, apparently Martin McGartland, witnessed the crash and was horrified by it. Instead of the conference being obliged to work on closely with the RUC, especially its SB, it just acknowledged that MI5 ran everything now because there was really no one else. The source who McGartland wanted to develop, whoever it was, didn’t need to be told that the Provos best hopes in a settlement had been greatly reduced by the crash. Little wonder that three months later, after everyone had been consulted on the mainland and back in Ulster, those in prison and those not, the Provos announced their long-awaited ceasefire." Go to: https://flyingcuttlefish.wordpress.com/2011/12/04/sabotaged-chinook/ For full article.